With the recent news of Marek “tween” Pacher leaving eSuba for Team Sampi, I also received the news of eSuba leaving Trackmania. A long and successful history in Trackmania comes to an end. Where their biggest victory came in 2011, with hakkiJunior finishing 1st at the World Championship in front of his team mate tween. In this article we look back at their biggest moments in the game, as well as some statements from the players who has been part of eSuba. Lately we have seen two eSuba players competing in Trackmania ProLeague Season 3. Them being tween and DanikB. Both have made it into the Stage 2 of Season 3, and is now just one step from competing at Paris Games Week in October. However, during this Season 3 of TMPL, we saw Team Sampi entering, and recruiting five of the players in the league. One of them being tween. So what we thought ended up being real. With no tween, there is no eSuba. So as a direct consequence of tween leaving eSuba, eSuba left Trackmania. Also worth mentioning is that kubayz, who were in charge of the eSuba line up, will now be in charge of the Sampi line up. Today is the day where an era ends after more than 10 years of existence. 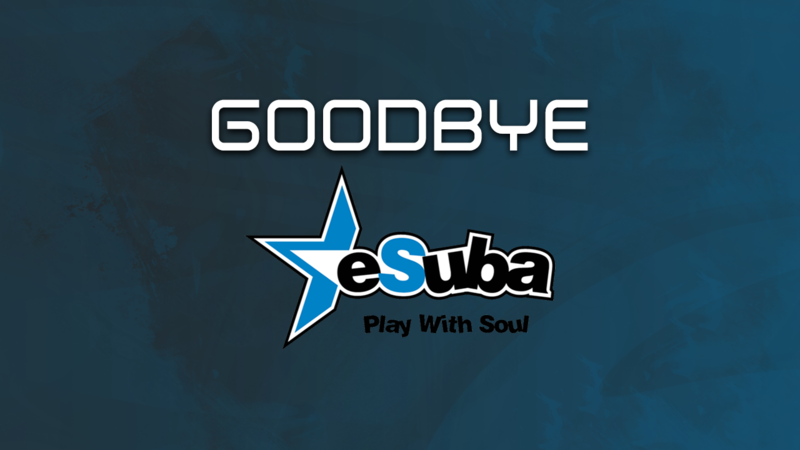 eSuba officially retires from TrackMania. There is a couple of reasons for this unavoidable decision and I don’t want to leave myself too much here. However, the main aspect of our mutual decision with eSuba to split ways was tween leaving to Sampi. At that point, it was only logical not to continue. The rest of the team, myself included, has no motivation to compete anymore and the last thing we want is to destroy the team’s legacy. I think it’s pointless to name all the achievements we have accomplished throughout all those years. I’d rather say thank you so much to everyone who supported us online and offline. Your support kept us going and we really appreciate you guys. I am so very proud that our team became a symbol of real friendship between the players and I am sure I am not the only one who will never forget it. Thanks for the ride. Leaving eSuba was a heartbreaking decision for me. After our triumph in Paris in 2011 with hakki, they were down to support us in absolutely everything. Over the years however, the LAN scene in Czech Republic and Slovakia died a slow death, leaving only international competitions afloat in the game. I knew this was a major issue for eSuba, and yet they kept being supportive, which I will always be grateful for. However, with the offer I got from team Sampi, I suppose I could tell right away it came in the right place at the right time. I feel a little refreshed and hungry to prove myself in the upcoming LANs. Part of it might be that I've done something for the first time since going pro - switched my team. Playing for eSuba was a dream I had that came true. It was more family, like close friends for life than teammates. So many favourite memories, I don’t even remember them all. So many lost rounds in online team matches because of laughter. Lot of matches won that were already "lost" thanks to teams ability believe in each other. Best trips especially to Paris. Best videoblogs from many places across Europe. If I could, I'd like to experience this journey again. Anyway it's right choice for both sides. For me personally best times of gaming era that I enjoyed gaming the most I could. Be a part of one of best teams in online and offline events. GG well played! It's hard to argue against eSuba being one of the most successful teams at Electronic Sports World Championship. Having one 1st place, three 2nd places and one 3rd place. Their biggest victory came in 2011 with Erik "hakkiJunior" Leštach becoming world champion in front of his team mate Marek “tween” Pacher. This double victory is one of the main reason as to why eSuba supported a team in Trackmania, and why they did it for such a long time. To follow up the success from 2011, tween placed 2nd at 2012 and 2014. And the last time ESWC had a Trackmania event, tween finished 3rd. Watch the ESWC 2011 on YouTube! But ESWC isn't the only event eSuba had success at. In recent years you could argue that Gamers Assembly has been the second most prestigious event, and is growing for each year. The 2014 victory from Marek “tween” Pacher being the highlight. A year where Erik “hakkiJunior” Leštach finished 3rd. Besides this tween finished 2nd at 2016, and hakkiJunior 3rd in 2013. Attending to events is not the only thing eSuba has done at their run in Trackmania. In 2015 and 2016 we saw TheNest being hosted in Czech Republic. A format where players were invited to a house to compete against each other on unknown maps. Both a social event, but also to see who is the best in the game. They did not only host it, they also ended up winning it with Marek “tween” Pacher in 2015. Tween also finished 3rd at the 2016 edition. So what has been your favorite eSuba memory, and how will you remember them? You wanna write about Trackmania? Contact HuntMania on Facebook, Twitter or NMD on Discord.